Across the country, fracking is contaminating drinking water, making nearby families sick with air pollution, and turning forest acres into industrial zones. Yet the oil and gas industry is pushing to expand this dirty drilling—to new states and even near critical drinking water supplies for millions of Americans. We need to show massive public support to stop the oil and gas industry from fracking our future. 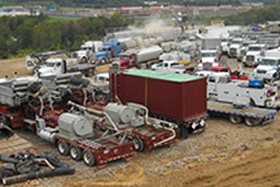 There are already more than 1,000 documented cases of water contamination from fracking operations—from toxic wastewater, well blowouts, chemical spills, and more. Moreover, fracking uses millions of gallons of water. Yet the oil and gas industry wants to bring fracking to places like the Delaware River Basin, which provides drinking water for 15 million people, and Otero Mesa, which hosts the largest untapped aquifer in parched New Mexico. Our national parks and national forests are the core of America’s natural heritage. Yet federal officials are considering leases for fracking on the outskirts of Mesa Verde National Monument, along the migration corridor for Grand Teton’s pronghorn antelope, and right inside several of our national forests. Along with air and water pollution, fracking would degrade these beautiful places with wellpads, waste pits, compressors, pipelines, noisy machinery, and thousands of truck trips. Families living on the frontlines of fracking have suffered nausea, headaches, rashes, dizziness and other illnesses. Some doctors are calling these reported incidents “the tip of the iceberg." In light of all this damage, we’re working to ban fracking wherever we can—from New York to North Carolina to California. But we also need the federal government to step in and take immediate action to protect families and communities impacted by this dirty drilling. So as first steps, we're calling on Congress to close the loopholes that exempt fracking from key provisions of our nation’s environmental laws. And as federal officials mull weak fracking rules for public lands, we’re urging our elected officials to step in and keep fracking out of our national forests and away from our national parks. If enough of us speak out, we can convince federal officials to protect our water, our land, and our health from the dirty drilling boom. Contact your representative today. Check out our citizen action toolkit to see how you can fight fracking near you. Laced with cancer-causing and even radioactive material, fracking wastewater has contaminated drinking water sources from Pennsylvania to New Mexico. Although fracking produces billions of gallons of this toxic waste each year, it remains exempt from our nation’s hazardous waste laws. Researchers at the University of Colorado School of Public Health concluded that people living within a half-mile of gas drilling operations had higher health risks, including cancer. Federal officials are considering allowing fracking in several national forests—including the George Washington National Forest, which helps provide drinking water to more than 3 million people in the metro Washington, D.C., area.